Warning: This entire page is outdated!! Last updated in High School! I started off researching Artificial Intelligence. I soon realized that it required a much stronger math background that I had at the time. Instead, I shifted my focus to pollution and electric vehicles. I discovered this topic after reading an interesting article on hybrid cars, and I read extensively about them for several months (this was before their commercial release). During this period, I encountered a small ad about a local company called Curtis Instruments that was working on an electric auto-rickshaw project. I had gone to India the previous summer and understood the problem with auto-rickshaws (the pollution) and the electric vehicle technologies that would be needed for such a project. I gave Curtis Instruments a call and was put in touch with Wilfredo Chaluisant. Mr. Chaluisant, an incredibly patient, friendly, and generous man, would become my research mentor. My topic slowly shifted to "The Effects of Electric Scooters in Developing Nations", specifically urban air pollution. I worked with Wilfredo on my 10th grade thesis and presented my initial research thoughts at my high school's end-of-year symposium. I interned at Curtis Instruments and learned a great deal about electric vehicles and pollution caused by ICE (Internal Combustion Engine) vehicles. I read extensively about pollution in developing countries and also sent out many emails to scientists researching similar effects. However, I soon discovered that the viability of this topic was fading. I needed lots of data to continue and key emails I sent to researchers never elicited responses. Continuing research on this topic was looking very precarious. Wilfredo and I met many times to look for new projects, but no viable projects surfaced. Because no topic was present, things were pretty shaky for the first month of school. Wilfredo got me a meeting with Jon Marshall and Gene Finger, two engineers who worked at Curtis Instruments. I met with them and talked about the requirements of the course and discussed my different areas of interest up to this point. They started posing some research ideas that sounded very viable and interesting (like working on the Curtis Electric Bicycle project) and I was soon working on my new research project, Pulse Charging Algorithms for Nickel Metal Hydride Batteries. It revolved around manipulating the different variables in a pulse train (namely amplitude and frequency) and observing the effects on charging. The only battery pack for testing was a group of 20 batteries that were at many different chemical states. Some had self-discharged very low, and were damaged, some had reasonably high float voltages. We had to condition and normalize them before we could start any testing. As the school year progressed, it became obvious there was no way to complete the research in time. I decided that my attempts at conditioning and normalizing the batteries was interesting enough for the upcoming Manhattanville competition and the end of year school symposium. This chart shows all charge/discharge runs on the battery pack for conditioning and normalization. Before and after float voltages are shown with a connected line. You can see that the "before" line (connected red dots) varies a lot while the "after" line (connected black dots) is relatively normalized. You can also see that the average voltage has increased as well, hence conditioning. Based on ideas I had developed during last year's work, I knew exactly what I wanted to do. I was to produce a formula that would read in the current temperature of the battery and calculate the ideal charging current. It’s full title was “Temperature Regulated Charge Algorithms for Nickel Metal Hydride Battery Chemistries”. 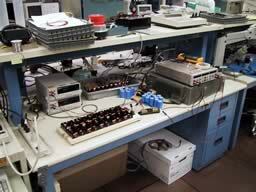 Ground work was already complete, and much of the hardware was available. I predicted most of the time will go into making a base formula that remotely works. Many formulas were produced with different characteristics. However, this was after a long list of preparation steps. Current charging technology assumes that all batteries are alike. 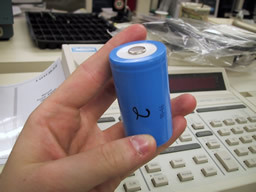 In reality, batteries are chemically unique and they are used in a variety of applications that further affect batteries’ chemical states. By Identifying a quantitative factor in batteries and exploiting this expression to control a charging algorithm would result in a highly efficient charge. This research produced a self-modifying charging platform that can adjust the charge intensity based on internal resistance expression from the battery. After identifying temperature as a good metric for determining charge intensity, the following steps were taken to reach the final formula and charger design. 1) Condition and normalize all 20 available Ni-MH cells using 1C charges and 1C discharges for one hour each. C is the capacity rating. Panasonic rates their Ni-MH D cells at 6500 mA capacity. Therefore, 1C equals 6.5A. This conditioning step is required to see if any batteries are unusually different and to bring the batteries up to more uniform voltage. 2) Heat dissipation tests – Select a battery and record the temperature at several different points on the skin of the cell. This procedure was used to find the spot on the battery with the least thermal lag and cleanest data. This includes charge and discharge runs. 3) Use data found in step 2 to create a basic formula for temperature regulated charging. This is most easily achieved by determining areas of high and low internal resistance. 4) Construct Five Temperature sensors. (Used LM335 as the base for each sensor. The LM335 output voltage is the temperature in Kelvin. 1mV = 1°K. ) Used potentiometers to calibrate to equal levels. 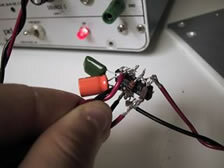 5) Build a “divide by 20” amplifier (Used a LM324 as the base). This is used to convert the 0-10V range on the DAQ card (Note: the DAQ card also has two 0-10V analog output channels that will be used to control charge) to the 0-500mv range the Hewlett Packard power supply (HP6264B) required for “External Voltage for Programming Output Current” mode. Thus, by varying the 0-10V on the DAQ card, the HP supply will vary from no current to maximum current; in this case the HP supply can output 0-20A. 6) Use one output on the TP430A supply (0-32V 0-2.5A) to simulate the DAQ card’s analog output channel (0-10V). 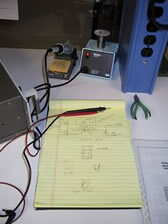 The current from the supply was then put through the amplifier (scaling the voltage to 0-.5V). 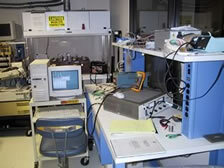 The amplifier was then connected to remote control terminals A4 and A6 on the HP supply. After confirming the TP430A supply was controlling the current on the HP supply, it was important to determine if the output current was linear. It was not. 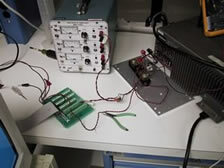 To acquire a scaling formula, it was necessary to test the supply from 0V to 10V in .5V increments and graph it with the current data from a shunt. A cubic regression proved to be the best fit with R2=.998. This scaling formula is used to convert the program’s desired amperage to a compensated voltage value that will be sent to the analog output channel on the DAQ card. Noise, wire resistance, etc. will cause values to differ slightly than the predicted current. 7) Full testing on the setup using a shunt as the load and manually supplied temperature data. 8) Check if the desired current is achieved by comparing what programming predicts current should be and what the 25A shunt reads. If amperage is significantly different, revise scaling formula. In this case, the formula found in step 6 was not appropriate when using the 0-10V on DAQ card (step 6 simulated a DAQ card using another supply). This was solved by programming a new Virtual Interface (VI) that allowed the analog output voltage on the DAQ card to be manually controlled. Data in .5V increments was taken. A new, superior scaling formula was created. 9) Incorporate formula found in step 9 into VI. Complete full testing on the setup using a shunt as the load and using manually supplied temperature data instead of a real battery. 10) If scaling formula is still flawed, “tweak” until difference is acceptable. Differences of up to .5A were experienced, which was not acceptable. In order to scale correctly, two formulas were used. This was caused by a conflict with polynomial equations with powers greater than 3 in Labview. A single formula (3rd power) had residuals up to .8 amps and low R2 values because of this, so two formulas with 3rd power equations were used, each with very high R2 values (.9995+). One formula controlled current from 0A to 7.32A while the other controlled current 7.32A to 15A (a 15 amp limit was programmed in for safety). The new dual-formula scaling system had differences no greater than .2A. This was acceptable. 11) Modify VI to read battery temperature instead of manual input for testing purposes. 12) Test setup with battery. Record temperature/current/voltage data for charge run. If desired, modify temperature regulation formula (original was found in step 3), discharge battery and charge with new formula. 13) Repeat step 13 until formula is controlling charge efficiently. By late August setup was complete and full testing could begin on a full range of test formulas. These formulas had already been created by studying previous data on temperature during charging. A few formulas stood out and were refined further. Over several months 9 different candidate formulas were produced. The final Formula, number 9, started at a 15A charge, but had sufficient temperature dampening so that the battery never exceeded 33°C. A paper was written for the Intel/Westinghouse Competition, which can be downloaded. I enjoyed some success in various science competitions, ultimately reaching the prestigious International Science and Engineering Fair (2002), where I won 4th place in Engineering.